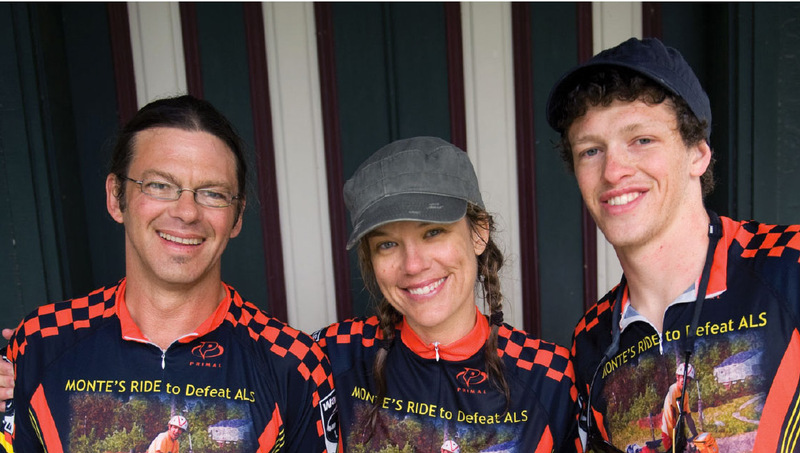 To raise money for ALS research, Mitchell, Catherine, and Kieran Clute biked 800 miles this past June to the Iowa Writers' Workshop reunion. On May 27, Mitchell Clute, 92MFA, his wife, Catherine, and 18-year-old son, Kieran, embarked on an 800-mile journey from their home in Fort Collins, Colorado, to Iowa City. Not by plane, train, or even bus, though. Instead, they traveled by bicycle in honor of Mitchell’s dad, Monte, who died of Amyotrophic Lateral Sclerosis (ALS) in 1995. The trio cut a path across Colorado, Nebraska, and Iowa, enduring heavy rain, unforgiving heat, and blown tires to arrive on June 9 for the official celebration of the 75th anniversary of the famed Iowa Writers’ Workshop. In the process, Clute and his family raised thousands of dollars through “Monte’s Ride to Defeat ALS” for the ALS Association’s Rocky Mountain Chapter. Their story attracted local and national media attention—and awareness for Lou Gehrig’s disease—with every mile they pedaled. In June 1979, when Clute was 13, his father organized a month-long family bike trip from their Colorado home to visit grandparents in Michigan. Clute’s tribute ride traced much of that same path and brought back warm recollections of his dad’s adventurous and joyous spirit. “My strongest memories [are] the exhilaration of being out in the open on a long day’s ride and the attendant sense of freedom, both physical and psychological,” writes Clute in his blog journal at www.montesride.org. As he learned about his father’s ALS diagnosis on his last night in Iowa City in 1992, Clute—now a producer and editor for a Fort Collins-based multimedia publisher—decided it made perfect sense to make the Writers’ Workshop celebration his destination this time. He even built his own bicycles for the journey. Monte’s Ride covered an average 60 miles per day, the first and last legs of the tour including Colorado and Iowa bikers who wanted to show their support. Among them was University Relations photographer Tim Schoon, who captured images along the rainy last 30-plus miles from Washington, Iowa, to the UI’s Dey House. ALS is a degenerative disease that attacks the motor neurons, resulting in paralysis and death. Currently, there’s no cure for the approximately 5,000 people diagnosed each year in the United States. The illness steals the ability to speak, move, and, in the end, breathe. With help from a walker, Monte Clute—always a physically active person— was able to stay mobile until his death, facing his fate with grace and dignity and continuing to live each day to the fullest. When he rolled into Iowa City on June 9, Mitchell Clute had an answer for his father.